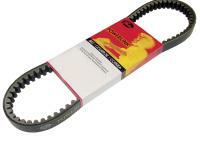 Gates Powerlink Premium Kevlar Drive Belt size 937 X 36X 28. This belt is suitable for: Suzuki King Quad 700, Jinlin 695 cc ATV, CFMoto 500cc ATV. Please check CF Moto 500 engines to match sixe before ordering. Good replacement for OEM Carlyle part #UA401 longer than factory so it gives you more take off.